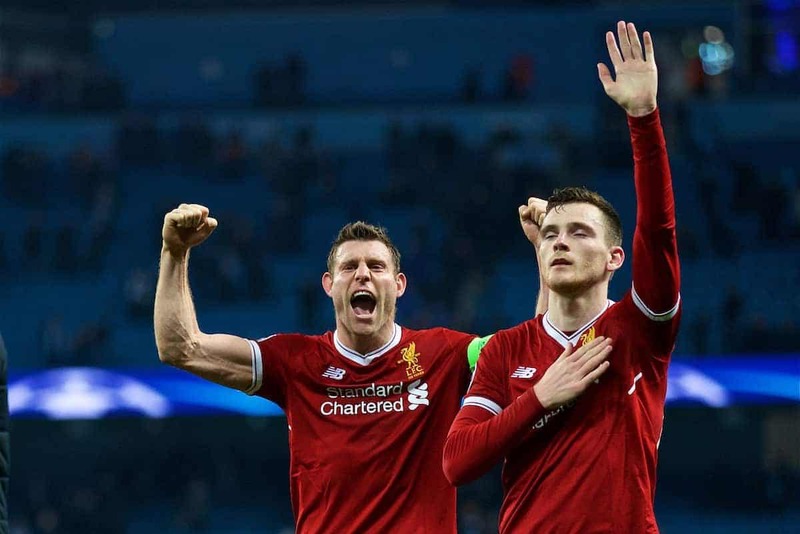 Liverpool secured their place in the semi-finals of the Champions League by virtue of a 2-1 second-leg victory over Man City on Tuesday night. The Reds made the final four of Europe’s elite club competition with a 5-1 aggregate win over the Premier League champions-elect, in a brilliant two-legged performance. After blitzing City in a 3-0 thrashing at Anfield last week, Jurgen Klopp‘s side took to the Etihad seeking a vital away goal to ensure progress. Things didn’t get off to the brightest of starts, however, as Gabriel Jesus struck within two minutes with City applying pressure throughout the first half. But after weathering the storm, Mohamed Salah and Roberto Firmino both scored to cap a strong display littered with excellent individual showings. Trent Alexander-Arnold, Dejan Lovren, Georginio Wijnaldum, James Milner and Sadio Mane were among those to impress, but who stood out for journalists and statisticians? It comes as little surprise to see Alexander-Arnold (8.2), Milner (8.2) and Firmino (8.2) receive the highest ratings, given their all-round influence on the result. And not far behind, Lovren (8.1) and Salah (8.1) are both rightly lauded as difference-makers at either end of the pitch. 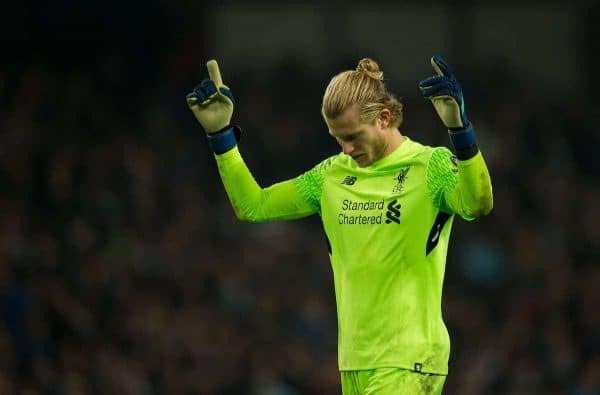 Loris Karius (7.3) is rated the lowest of any player, but this is largely due to the efforts of his back four, with 12 of City’s 20 shots on goal blocked and only three on target. The goalkeeper is one of six players to receive at least two individual ratings of nine or 10 out of 10, however, along with Alexander-Arnold, Lovren, Milner, Salah and Firmino. 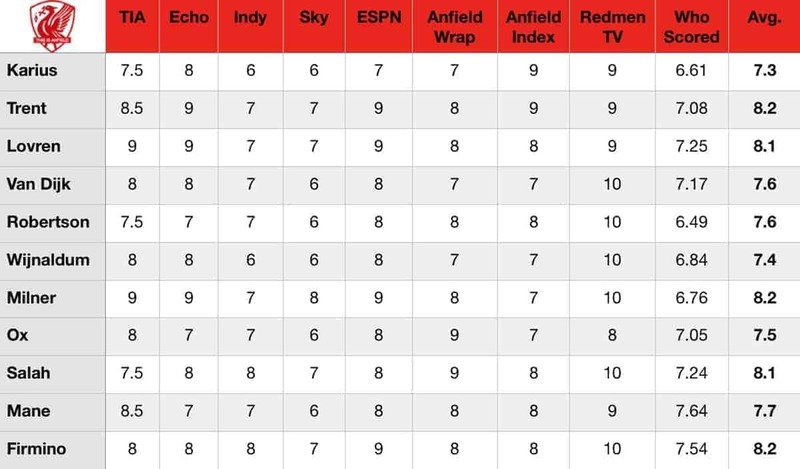 A clear point to note is the difference between the ratings of Liverpool-centric publications and those of a more partisan persuasion, with both the Independent and Sky Sports doling out six-out-of-10 ratings. Georginio Wijnaldum (7.4) was deemed one of the Reds’ worst performers by both, with the overall ratings of Mane (7.7), Alex Oxlade-Chamberlain (7.5), Andrew Robertson (7.6) and Virgil van Dijk (7.6) also suffering as a result. On a statistical basis, a difficult first half for Klopp’s midfield is reflected with lowly ratings for both Milner (6.76) and Wijnaldum (6.84), with City bypassing the middle of the park. Robertson (6.49) was the least influential in this regard, while Karius’ quiet night (6.61) was also highlighted by WhoScored. Interestingly, their top performer was Mane (7.64), which is arguably more representative of his overall display, having continually tested the City back line with seven successful dribbles. Having rung the changes between both legs, with five alterations for the Merseyside derby, Klopp could opt to omit some of his top performers for Saturday’s clash with Bournemouth at Anfield. After a phenomenal showing at Anfield that saw a host of talents shine, it could be worthwhile to provide them with another rest.